An Easier Way To Pay In Stores. Paying in stores or within apps has never been easier. Gone are the days of searching for your wallet. The wasted moments finding the right card. Now payments happen with a touch. Apple Pay will change how you make purchases with breakthrough contactless payment technology and unique security features built right into the devices you have with you every day. So you can use your iPhone, Apple Watch, or iPad to pay in a simple, secure, and private way. 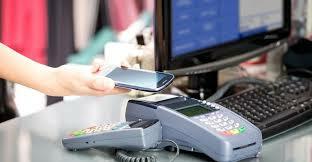 Embrace emerging digital payment technologies and position your business as an innovative organization. Faster sales make for shorter lines and happier customers. Full card numbers are never used or stored on the phone, or your equipment. Double-Click To Pay And Go. 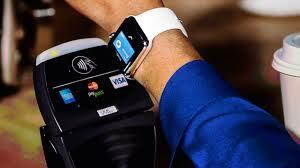 To pay with Apple Watch, just double‑click the side button and hold the display of Apple Watch up to the contactless reader. A gentle tap and beep confirm that your payment information was sent. Passbook already stores your boarding passes, tickets, coupons, and more. Now it can store your credit and debit cards, too. To get started, you can add the credit or debit card from your iTunes account to Passbook by simply entering the card security code. Add additional cards on iPhone 6 within the Passbook app. Just tap the plus sign and follow the onscreen instructions. On iPad Air 2 and iPad mini 3, start by opening Settings, tap “Passbook & Apple Pay”, then tap “Add Credit or Debit Card”. For Apple Watch, open the Apple Watch app on your iPhone, tap “Passbook & Apple Pay,” then tap “Add Credit or Debit Card.” The first card you add will be your default payment card, but you can always choose a different card when paying or select a new default.